An attractive French mantel clock with a silk suspension in the 'Pendule portative' style with a decorative carrying handle. The glass is removed to wind the clock and unusually it is removed from the right hand side. The dial is vitreous enamel showing the makers name and Roman numerals, it does have slight hairlines to the corners as can be seen in the pictures but you have to be very close to see them. If the new owner would like these permanently removed, it can be arranged for an extra cost. Personally I would leave them as they are really are faint. The clock is of 7 day duration and has a bell strike for the hour and the half hour. The case is ebonised with brass inlays of geometric style. A glass aperture to the top and one to each side. The rear door opens to reveal a fully overhauled mechanism. 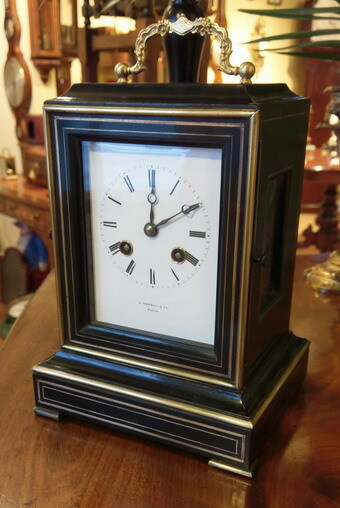 The clock was made and retailed by J.Sewell and Co of Paris who produced superb clocks throughout the mid 19th Century.